As you may have heard me mention before, I’m typically not a fan of pink. I prefer bright tones to pale ones when it comes to this color, so that’s why, when I spotted this fabulous Kate Spade coat in a punchy watermelon hue, I knew I had to have it. 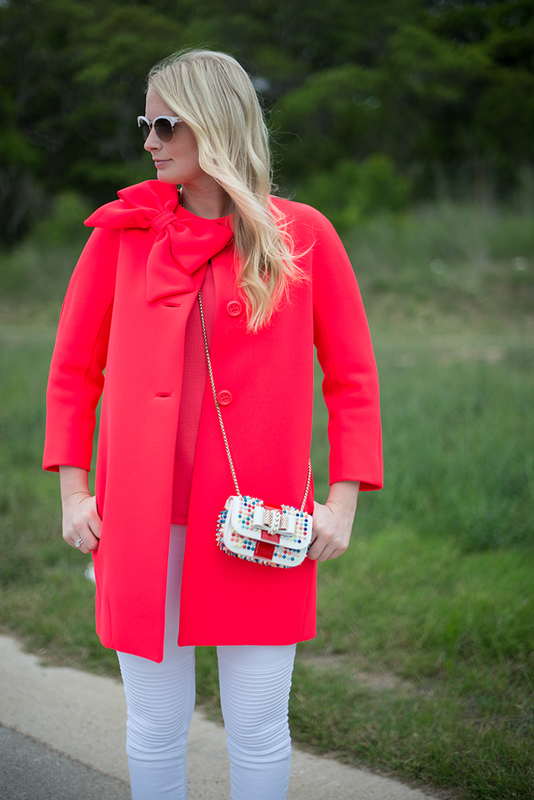 The color is almost shocking it’s so bright, making it the perfect statement coat for spring, don’t you think? It’s one of those rare pink pieces in my closet that I know I’ll wear again and again. With this coat and my yellow Zara coat I think I’m set in the color department as far as coats go. Another pink piece I picked up recently is this feminine Lela Rose blouse – the three-quarter bishop sleeves add a little something extra to the silhouette. Pretty, right? It looks great dressed casually with jeans and shorts, but it’s also a wonderful work top – just tuck it into your favorite pencil skirt and you’re good to go! Now onto accessories… When I first saw this Christian Louboutin Sweet Charity bag, it reminded me of a candy store. 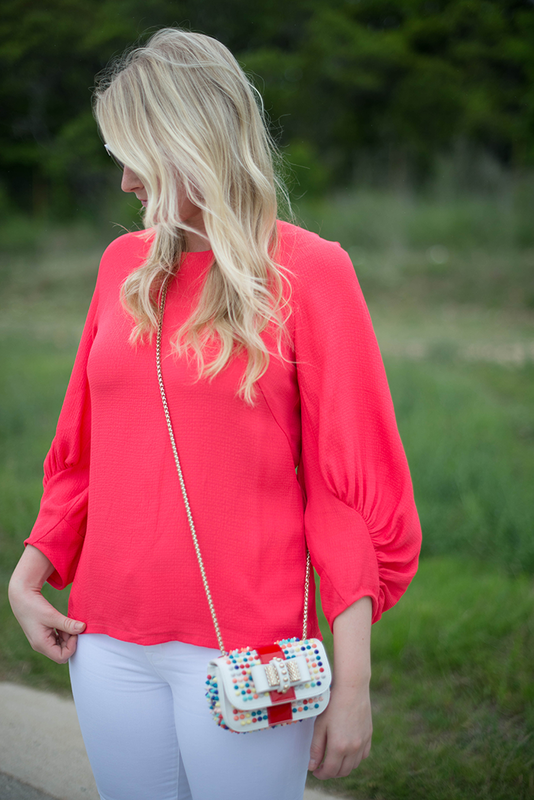 All of the fun colored spikes make it an adorable crossbody that actually goes with all my favorite spring and summer pieces day and night – all the different colors make it easy to wear with a ton of other colorful stuff in my closet. If you’re looking for a new pair of sunnies for summer, these white cat-eye glasses by Kate Spade are perfect! They have just the right amount of flair, but can be worn with everything. The best part about this outfit? Everything I’m wearing is available for purchase right now (i.e. nothing is “similar” and nothing is sold out) – that almost never happens! Get while the getting’s good. Love this coat on you, I have had my eye on it also! I LOVE everything in this post – that bag and coat though are sooo amazing!!! 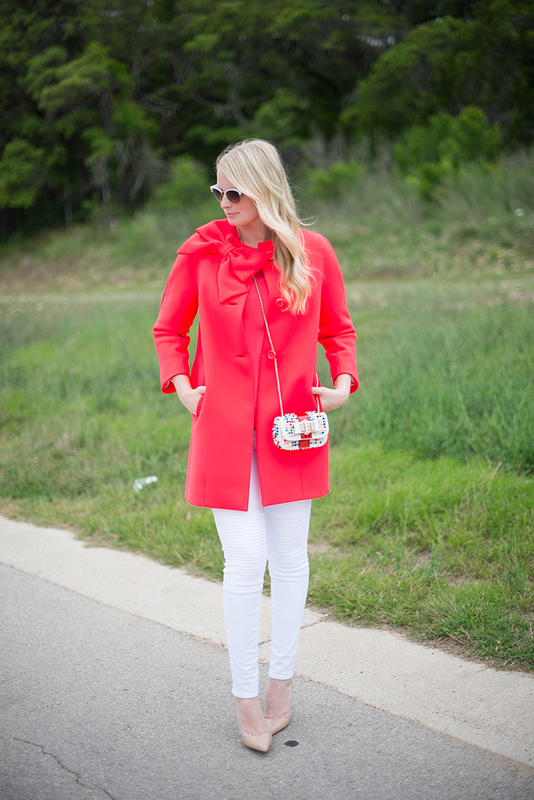 I love this coat, it’s the perfect punch of color! And that bag is so fun and cheery! LOOOVE that coat! practically anything with a [tasteful] bow, I’m all about, and KS does it best. Love the color too! Love the big sleeves on this top, so so so chic! That coat is to die for!!! Exquisite color and style! You look fantastic! omgggggggggggg that coat! It’s amazing and yes, that bag is SO fun! I love that coat!! The color is great! That bag is so cute! GORGEOUS!!! Die for this color… Love the Louboutin accessories. So perfect. The coat could not be cuter and I adore those white jeans, too! This coat is so beautiful! Okay, so I am coming to Dallas & raiding your closet! Love the top and jeans. 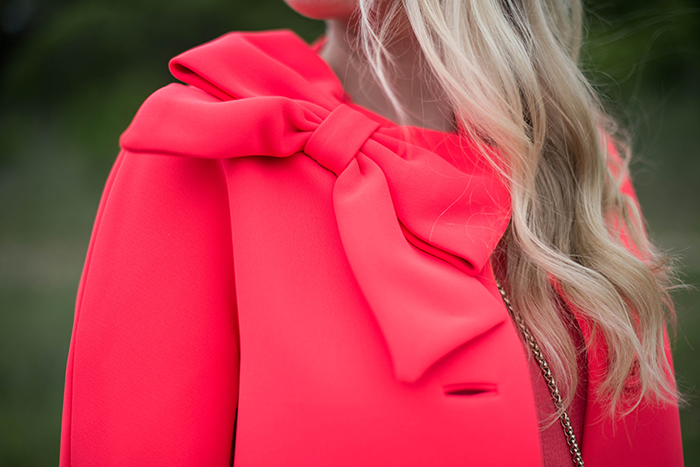 The bow on the jacket!! I love it!! That coat is absolutely gorgeous! Such a vibrant color! Love the bag too, and it all looks fab with your white jeans. I have been obsessing over this coat since I first saw it. Beautiful. You always look so polished!!! It is amazing! This outfit is so amazing!!! YES that really does look like candy love it! YOU ARE WEARING MY FAVORITE COLOR! Love it on you! that color is amazing. I’m not usually a bright person but I’m definitely captivated by that hue especially with the white skinnys, and that bag is the perfect accessory. You look amazing, pretty lady. gosh! you’re so good at matching!! love how the top and the coat match perfectly. the detail on the knees of those jeans is amazing too! That coat, of course, is perfection.